Fitnastica uses our proprietary algorithms to process smartphones accelerometer raw data to properly detect human body or sport gear periodic motions and to count them. Fitnastica uses our proprietary algorithms to process smartphones accelerometer raw data to properly detect human body or sport gear periodic motions and to count them. This application also calculates time spent for exercise, speed, motion amplitude, angle and calories burned. All results are automatically saved in files. Fitnastica works well for all sport exercises. Mount your smartphone at place which surely moves during your exercise! Belt mounting can be used for walking, running, jumping, pull-ups etc. Arm mounting is good for most of body exercises like push-ups, squats, crunches, dips, pull-ups etc. Make sure that you mount smartphone properly and it moves during your exercise. Remember that Fitnastica counts motions of smartphone, therefor it must move synchronously to your body motions. Use smartphone sport armbands for better experience with Fitnastica. For Gym machines you can put your smartphone on machines moving parts. All results are automatically saved in files named by exercise number. Files are saved in “*.csv.txt” format which allows easy importing of all collected data into Excel. 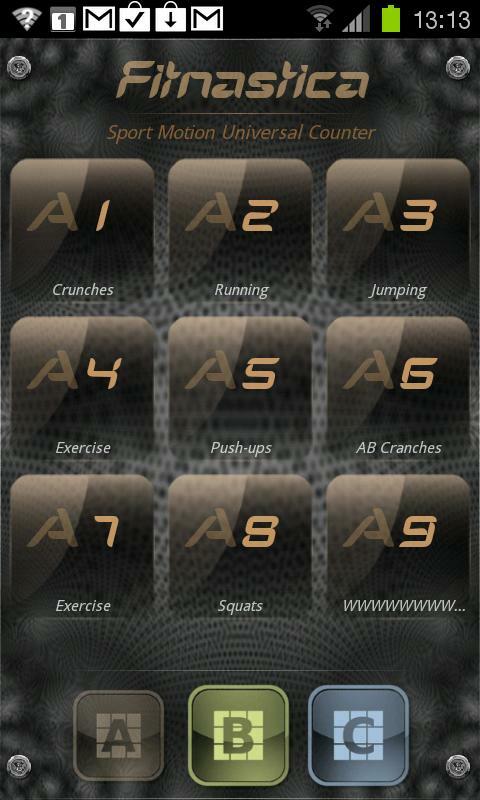 There are three groups of 9 exercise each available in this application. Groups are named A,B and C.
You may use those groups for different purposes upon your decision. For example, you may use group A for your main exercise plan, group B for your friends and C for your other exercises. Select the group then press an Exercise button to enter Counter Screen. Press the Center of Touch Screen to start counting. Then follow instructions to begin exercise. Press "STOP" button when you're done. Note that if you've configured your exercise to stop automatically ("autostop"), you have to just wait for few seconds for Fitnastica to detect “no-motion” to finish counting. You spend different amount of Energy for every exercise. It depends on Speed, Amplitude, Reps and Weight moving during the exercise. Fitnastica calculates all needed parameters except the Moving Weight. Moving Weight is different for different exercises. If you do squats or you walk, run or jump Moving Weight is the Weight of your body. But if you lift dumbbells Moving Weight is the weight of dumbbells. Please enter proper value of your Moving Weight in Settings Screen for Calories Calculator to work properly. Moving Weight should be entered in kilograms. It shouldn't be extremely accurate but reasonably close to the real value (+- 5 kg). Thank You for choosing Fitnastica!